This Atlas Hârnica map covers part of the mountainous, fjord-riven lands of the Kingdom of Orbaal. 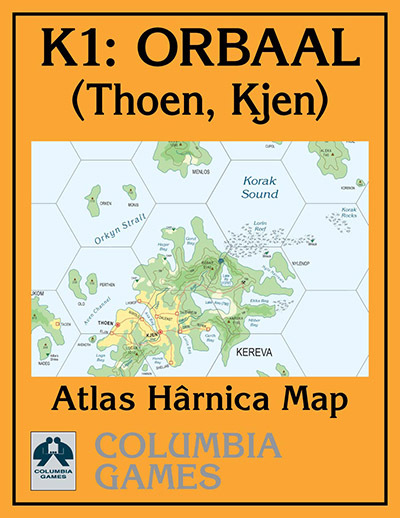 The map includes Kereva Island and its numerous smaller neighbors in the Balaka Islands chain off Hârn's northeastern coast. The two keeps on these islands, Thoen and Kjen, pay tribute to the dangerous Clan Sherwyn, which dominates the region from Sherwyn Castle on Gedil Island to the west. Like the rest of Orbaal, the terrain in this area is rough, with scattered villages, towns, and cultivated lands mostly along the coastline. The wild terrain, harsh seas, barbarian tribes, colonies of gargun (Hârnic orcs), and much more offer plenty of opportunities for adventure in Orbaal.